Based on Derf Backderf’s 2012 graphic-novel memoir and written for the screen and directed by Marc Meyers (2015’s “How He Fell in Love”), “My Friend Dahmer” dares to explore the formative years of notorious serial killer Jeffrey Dahmer before any of his actual murders that weren’t exposed until 1991. In the most psychologically disturbing sense, this is more of a coming-of-age story than a horror film that plants the seed of early psychosis by simply observing its subject in the late-1970s (shot in Dahmer’s real-life childhood home, to boot). It might not offer many new insights, but without excusing Dahmer’s actions that would devolve from weird to downright sociopathic, “My Friend Dahmer” is oddly a rather empathetic portrait the way it depicts high school and a broken home for an incipient serial killer before he passes the point of no return. In 1978, Bath, Ohio, Jeffrey Dahmer (Ross Lynch) is a senior at Revere High School. He’s a social outcast and just plain off. Although he plays tennis and plays in the marching band, Jeffrey mostly keeps to himself and spends his days after school collecting roadkill carcasses and dissolving them in jars of acid in a shed—his “lab”—in the woods. At home, his chemist father, Lionel (Dallas Roberts), wants Jeffrey to get out of his shell, going as far as throwing away all of his son’s animal-filled jars, while his mother, Joyce (Anne Heche), suffers from mental illness. Once Jeffrey realizes his “spazz attack” performance, inspired by his mother’s interior decorator with cerebral palsy, gets him attention at school, he is welcomed into a group of pals, John ‘Derf’ Backderf (Alex Wolff), Mike (Harrison Holzer) and Neil (Tommy Nelson), who find him oddly hilarious. Even as Jeffrey finds himself more accepted by this trio of friends, his parents file for divorce, forcing him to take up drinking and show even more erratic behavior. Jeffrey Dahmer’s violent tendencies, sexuality and biology aspirations slowly awaken once he finally meets the doctor (Vincent Kartheiser) who jogs past his house three times out of the week. Sensitive and unsettling in equal measure, “My Friend Dahmer” soundly centers on one pivotal stage in its subject’s life and never strays with a framing device or flashbacks. In a way, it still feels made up of moments that don’t always build upon each other, which might have increased the sense of dread, but the most compelling constant in the film is the actor portraying Jeffrey Dahmer. As the growing trend goes with Disney Channel alumni taking risks on the big screen, 21-year-old Ross Lynch takes the darkest route in portraying Jeffrey Dahmer. In what should be his breakout role, he alarmingly disappears and finds a sliver of sympathy before the monstrous side completely takes over. It’s especially uncomfortable to watch Jeffrey keep resorting himself to his prankish “spazz” stunts in the school halls and eventually, much to the encouragement of his “friends” and some jocks, a shopping mall. Dead-eyed behind clunky aviator glasses and physically awkward with a slumped-over gait, Ross’ performance is less mannered than it is subtle, bottled-up and chillingly detached. In supporting roles that bring context to who Jeffrey Dahmer is and who he will become, Dallas Roberts and Anne Heche are effective as Jeffrey’s bickering parents, and as aspiring-cartoonist Derf, Alex Wolff has an inviting presence but also gets to convey culpability and standoffishness through the course of his friendship with Jeff. Writer-director Marc Meyers lays out an ethical conundrum and goes just far enough to the edge to allow one to empathize with a budding serial killer. Viewers who hope for cut-and-dry answers will not get such a thing since it is impossible to pinpoint what drives someone to commit such unspeakably awful crimes, but the groundwork is set up to hint at Jeffrey Dahmer’s homicidal and cannibalistic tendencies with his reclusiveness and morbid bone fascination. The signs are certainly there, as impure thoughts bubble inside of Dahmer, even if he hasn’t quite acted upon his impulses yet. As the film ends with Jeffrey picking up hitchhiker Steven Hicks, the viewer knows where things will lead and that all hope is lost. 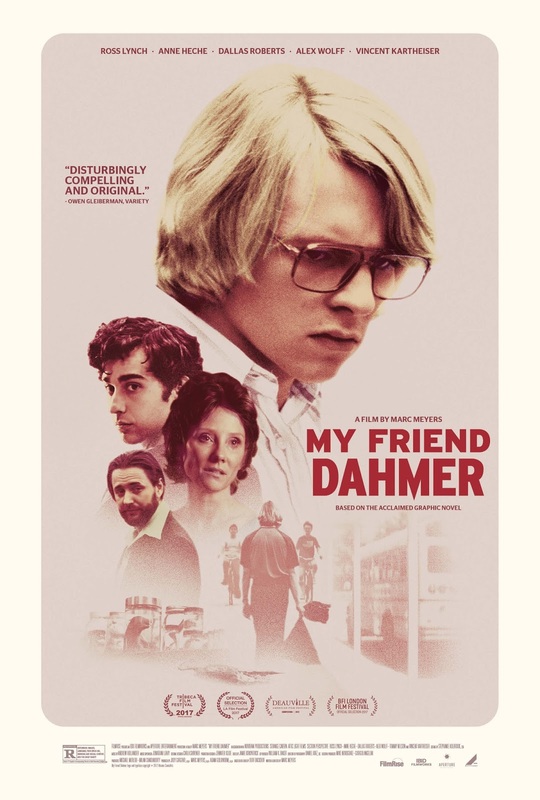 If “My Friend Dahmer” is absorbing enough in the story it tells and never pats itself on the back with an ultimate verdict on what made Jeffrey Dahmer a monster, it does make one intrigued to research more.